What chocolate should be on your list. 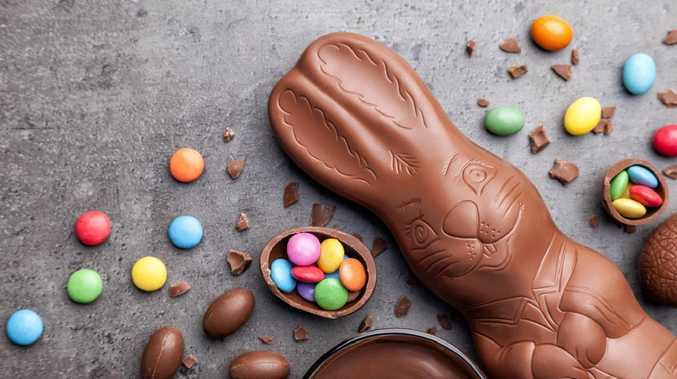 Whether you're five or 85, there's something special about receiving chocolate at Easter. But with so many options now available in seemingly every flavour conceivable, what should you choose? 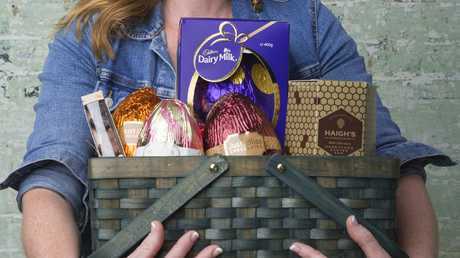 To make the decision easier, we asked chocolatier and pastry chef Jodie Neilson, former MasterChef contestant-turned-pastry chef Nicole Stevenson, as well as chocolate lover Rachel Bergin to put a range of supermarket and gourmet Easter goodies to the ultimate taste test. Judging all chocolates blind, they critiqued them based on taste, texture, quality and overall likability. 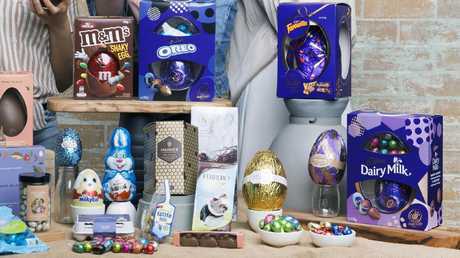 With the box sets they only judged the large eggs heroed in the packs. The results show that whether you have a little or a lot to spend, there's something for everyone. Rachel: That was delicious. I like the texture because it's sort of a bit of a hybrid between a chocolate and a cookie. But there's also a few flavours in there like coconut - like a coconut rough - which was delicious. Nicole: I really liked it. 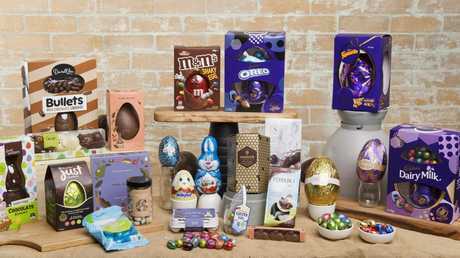 I think Easter eggs can usually be one dimensional, but it's got a really good texture and there's a balance between sweet and salty. Jodie: It's got good texture with the crunchiness of it, but it's really, really sweet. Jodie: These are great. The texture is wonderful. I love a sugar shell. The hazelnut, the gianduja, whatever you want to call it, in the middle is great. It's texturally lovely as well. It's really, really sweet, so you're not going to get a dark chocolate lover loving these. But for a sweet, milk, hazelnut lover, these are great. Nicole: I really love it. It looks amazing. They scream Easter to me. I love the really thin candy shell on the outside - it's really well made - and then the hazelnut filling is really nice. Rachel: I liked the look of them and it tasted sort of like a Ferrero Rocher to me but that's just the hazelnut coming through, so that was really delicious. 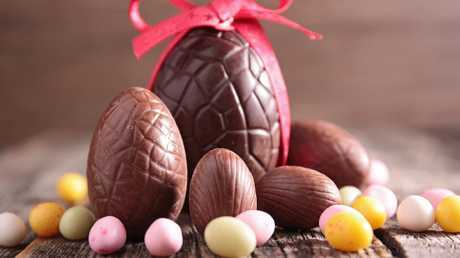 Whether you’re five or 85, there’s something special about receiving chocolate at Easter. But with so many options now available in seemingly every flavour conceivable, what should you choose? Rachel: I thought that was a nice and smooth dark chocolate. Probably high up in the cocoa content - a bit too much for me. Nicole: I really like it. I'm not sure what the background note is but it's almost nutty. It's really balanced. It's not overly sweet. It feels like a good quality chocolate. Jodie: That's delicious. It's interesting chocolate. It's nice and smooth, texturally great. It's different to your standard dark chocolate - it's got some interesting flavour notes in it. Rachel: I'm not a big dark chocolate fan but that's good dark chocolate if you're wanting to introduce someone to dark chocolate because it has honeycomb throughout. I was surprised by it. Nicole: It's quite sweet for a dark chocolate, but it is an Easter egg and I guess it's supposed to be sweet. The texture does save it from how sweet it is. Jodie: I liked that one. That one was great. The texture was lovely. It was very sweet but it's got honeycomb in it so that's a fair cop. It's smooth, the cocoa powder is quite strong so it's got a decent amount of all the good stuff in it. Jodie: This is actually pretty tasty chocolate. It's very sweet but there's high cocoa butter, either that or whatever oil they've put in is awesome. I'm not getting a huge residual on my mouth. It's very, very sweet. I'm actually quite impressed with that one. Nicole: Out of all the solid eggs we've tried, that's definitely been my favourite. It tastes more like Belgium chocolate to me, rather than a generic chocolate that we make here in Australia. It tastes a lot better quality than the other mini eggs. I would quite happily smash a few of those. Rachel: I think it has a bit of a mature taste for an adult's palate. It's really smooth and rich so I like it. Nicole: I have so many mixed emotions because the chocolate on the outside tastes bad quality and it kind of tastes like bad Nutella on the inside. But I like the idea and where they're going with it. It has a lot of nice things, but it has equally as many things I don't like about it. Rachel: It sort of tastes like a dark Ferrero Rocher. 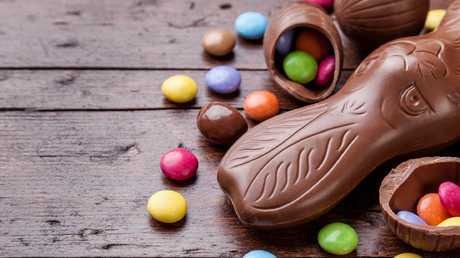 It's probably a good chocolate for people who are dieting over Easter because you'll have one and you won't go back for me because it's so rich you don't need anymore. Jodie: The chocolate wasn't awesome quality chocolate, but the texture was great - I loved that crunch and then the smooth ganache. Rachel: I really liked that. If you like white chocolate, or even if you don't like white chocolate I think that's a good one to try. Jodie: I don't like it. It's too sweet and I think it's gritty as well. I don't think it's a true couverture chocolate. I think it's a compound chocolate that may have a bit of cocoa butter in there. It's too sweet. Nicole: It's a very generic white chocolate to me. It kind of tastes like a Milky Bar. If you're not looking for super high quality white chocolate it's fine, but it was a little bit gritty. It's a very generic white chocolate egg. Rachel: I'm not really big on dark chocolate and if you don't like dark chocolate don't go anywhere near this - it's far too strong. Jodie: This is delightful. It's really good quality chocolate. Nice melt in your mouth, lots of cocoa butter, high cocoa mass. There's really interesting flavours - cinnamon-y notes in this one. I really like it and it's nice and thin and crisp. That's a great dark chocolate. Nicole: I really liked it. 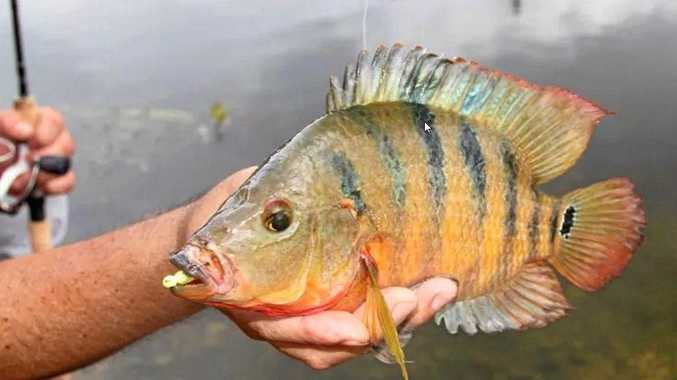 To me it tastes really fresh. A lot of the other eggs we've tried tasted stale to me, whereas this one does taste a lot fresher. I really like the cocoa percentage. If you like dark chocolate, it's maybe not as sweet as some of the other dark chocolate ones we've had. It's not so one-dimensional - it does have a few different background notes to it. Rachel: That has to be a Lindt chocolate. I love Lindt. Nicole: Texturally I hate how it's too soft and it's too sweet. It just leaves that yuck in your throat. Jodie: It's the texture of it because it doesn't really have texture. It just disappears and collapses. It's so incredibly sweet. That one sets your teeth on edge. Rachel: It's very sweet but I loved the mix between the milk and the white. It reminds me of a little Kinder Surprise egg. I really liked it. Nicole: I think it's fun. It does remind me of a Kinder Surprise. I like the milk and the white. I do think it's a little bit sweet, but I think the chocolate is probably more directed at kids anyway. Jodie: It looks great and it's kids' chocolate, but it's incredibly sweet. It's a bit gritty and it's not the best quality of chocolate. Jodie: There's a distinct flavour there. It's not just milk chocolate I don't think, but I can't tell what it is. Texturally great, nice and smooth, not gritty, but it's really sweet. It's a super, super sweet milk chocolate. Nicole: I feel like there's an aniseed background note - like licorice. Texturally it's fine. For a milk chocolate it's fine. Rachel: It tastes like my childhood. It's extremely sweet, but that's your classic Easter egg that you wake up to on Easter morning. Jodie: I really like that. I think they're a bit too strong. There's that ginger bread, Christmas pudding, hot cross bun-style flavours, but it could be a little bit more subtle. I like the texture. I like the crunch on the outside and the softness on the inside. It's not just like eating chocolate, it's like eating cake as well. Nicole: I don't mind them. After I ate it though there was a really stale taste in my mouth. These haven't kept well so for me there's a stale taste. But I like that they're a little bit different. Rachel: The taste was a little overbearing. Jodie: I thought that was great. The texture was fine - it was nice and smooth. It's got high cocoa butter content. The darkness of it is great if you want a milk that is slightly darker than just your ordinary sweet milk (chocolates). I thought it was pretty good. Nicole: I'm trying to work out if I loved it or hated it. The texture is really good. It's really smooth. It's somewhere in between a dark and a milk. To me it still had a stale taste that a lot of the other eggs have had and I really hate that. It sits somewhere in the middle for me. Rachel: If someone gifted that to me I wouldn't touch it. It didn't have that really beautiful milk chocolate flavour for me. Jodie: Texturally it's fine. I like the crunch. The cereal-y thing is great, but terrible chocolate - gritty, cheap. Nicole: It kind of tastes like a Malteser but not as good so you might as well eat a Malteser. They're not bad. I would probably prefer to just smash a bag of Maltesers. Rachel: I prefer it to a Malteser because nothing gets left in your teeth at the end. Nicole: For me it just tastes like that Old Gold chocolate. I would take it or leave it. It's just an overpriced chocolate bar. Rachel: It's the sort of chocolate your grandparents would gift you that was out of date. Jodie: I actually don't mind it. Texturally it's fine. It's not gritty so it's got a high cocoa butter content in it. It's not very complex - it's probably a bit too sweet. But if you were just after a basic dark chocolate egg with no fanciness about it, I think it's fine. Rachel: There's a sort of plastic-y taste with that, but I don't mind it. If it's meant to be Oreo, that does not do Oreo justice. Nicole: You can tell it's supposed to be an Oreo chocolate because of the colour on the inside. It has so much potential - it could have yummy cookie bits and stuff but it's just got nothing. Even though there's two textures they almost merge in together for a really bad taste. Jodie: I actually really like the middle of it. The texture of the middle is great, but the chocolate is terrible and it's just too sweet. Jodie: It's cheap milk chocolate. It's not revolting, but it's not a chocolate that I would ever buy. It's just cheap, milk, gritty chocolate. Nicole: It's like that tingling feeling in my throat because it's so sweet. For me that is the epitome of Easter milk chocolate. I didn't hate it because it did bring back a lot of memories of childhood Easter chocolate. It's very generic. Rachel: It's like the Easter bunny that would still be in your cupboard four weeks after Easter that no one's touched. If there's nothing sweet left in the cupboard then you'll eat it but that's it. Rachel: I didn't think it was so bad. It just tastes like pretty good standard chocolate. Jodie: I liked that it was thin because then I didn't have to eat so much of it. I didn't like it at all. It just tasted like artificial, cheap, plastic chocolate. Nicole: It just tastes old. There's that real fattiness in your mouth. It tastes like really poor quality chocolate. Rachel: I didn't mind that one. It sort of tasted like it had a bit of marshmallow in it. Nicole: It didn't break down (in my mouth), so it's like low quality, low cocoa butter percentage. 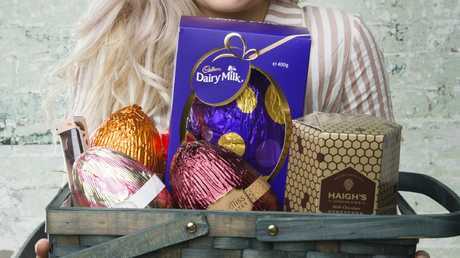 It's a very generic Easter egg that probably won't melt in your cupboard and we live in Queensland so that's probably a good thing. That's probably the only good thing. I didn't like it at all. Jodie: It had a really weird flavour. It's like condensed milk or something else in it, it's not just milk chocolate. It's cheap chocolate, not great quality. Rachel: At first I got a few nutty tones through it but then I got that plastic taste. Nicole: For me it doesn't really taste like anything. It doesn't even taste like chocolate. It just tastes like sweetness and sugar. Jodie: It tastes like plastic. It's got a real artificial overtone to it, which might be actually from their packaging, but you could taste the plastic. What I like about it is how thin it is. But it's not a good quality chocolate - it's super, super sweet. Rachel: It's not that bad, not that great. Nicole: It has like a rancid almond taste. It basically just tastes like off nuts. Jodie: I could get nut but I couldn't quite figure out what was wrong with it. The chocolate is actually fine, it's really sweet, but it's milk chocolate, but that aftertaste is rancid almond. Rachel: Originally I didn't really like the taste of the chocolate, but after a while I could taste a bit of Oreo. I like the crunchy texture, but I don't think the quality of the chocolate tastes that great. Nicole: I really don't like it. It has a weird metallic taste to it. The texture is probably the only thing that saves it. Jodie: Texturally it's fine. It's really fatty. I've got this real grease in my mouth. It's not good. And the Oreo taste is not strong enough. It's just sweet chocolate with a bit of texture. Jodie: They've formed their eggs beautifully but it's really not good chocolate. It's not horrible, but it's so incredibly sickly sweet. Nicole: It looked like it was going to be a boutique style egg because it was rough enough to look handmade, but it tasted very generic. It left that really awful fatty taste in my mouth. Rachel: Beauty is skin deep with that one. She's like a 10 on the outside but a 2 on the inside. Jodie: That's the worst one I've tasted so far. It's grainy, it tastes like plastic. It's so artificial. That's the most compound of compound chocolates we've had so far. Rachel: It stays in your teeth. You'd probably need to go straight to the dentist after eating that. I didn't mind the taste. Nicole: It must have a really low cocoa butter content because it didn't break down in my mouth. It just sat there and then all the artificialness came out. It had a wax taste. Rachel: I really didn't like that. It tasted cheap. Jodie: It's cheap, horrible chocolate. It's really gritty. It leaves that layer in your mouth afterwards. There's an odd flavour as well. Nicole: Terrible texture, bad flavour and it has that waxy, artificial flavour. Jodie: Physically it looks terrible. They're not very well made chocolate eggs. The chocolate is revolting. It's just compound chocolate. It's just gross. Nicole: It reminds me of the chocolate you used to get given at school before the Easter holidays. It's gross. Rachel: It's a bit of a stocking filler. You could get away with giving it to kids, but if you love them, don't give it to them. Jodie: They looked really pretty … but the flavours on the inside were all too artificial. They had that almost marzipan-y texture on the inside and that flavour that just hangs around for too long, which is a shame because they looked really pretty. I had high hopes for those ones. Rachel: I don't know what that filling is but it doesn't taste nice at all. It tastes like when you have fake tan on your hands and you accidentally taste your hands when eating something. Nicole: It tastes like Bondi Sands (fake tan). They say you eat with your eyes but they weren't beautiful enough to overcome how bad they tasted. You couldn't even pick what flavour they actually were supposed to be. Jodie: It is so artificial. The texture is gritty. It doesn't taste like chocolate, it tastes like plastic chocolate. There's nothing nice about it. Nicole: I don't even know what to say. It's terrible. Rachel: It's probably a really affordable egg and good to give to a two-year-old because they won't know the difference.